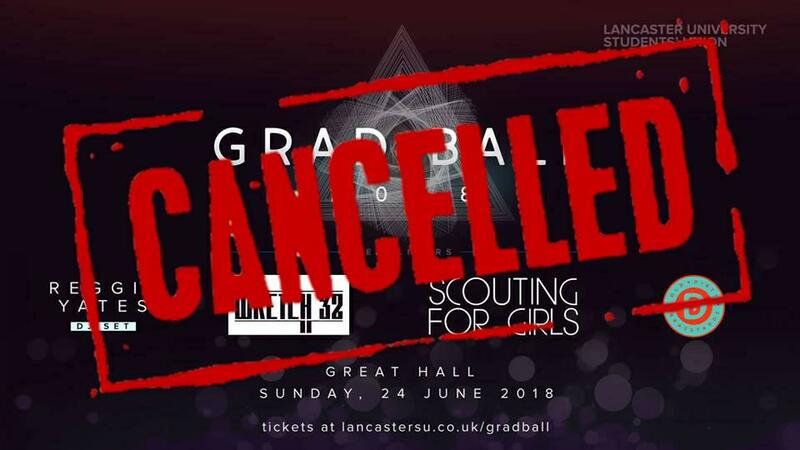 Lancaster University Students’ Union have cancelled Grad Ball today, due to disappointing ticket sales. This will be the first time in decades that the annual event will not go ahead. There was controversy over the decision to host the Ball in the Great Hall, as the event had been held at Blackpool Tower in previous years. The Union cited transport costs as the reason, as well as a desire to keep the costs involved in hiring the location to a minimum. A planned line-up included Scouting for Girls, DJ Reggie Yates and Wretch 32. It has faced criticism from potential attendees on social media, who branded the line-up “washed-out”. One difficulty the Ball faced was existence of a rival Ball, set up by students with the intention of hosting an event in Blackpool. The rival ball has been selling tickets for the 22nd of June, though it is yet to announce a line-up. One student who bought tickets said: “I am really annoyed at the cancellation of the grad ball as this was something which was going to end my three years of an undergrad degree with my friends and course mates”. “We’re sad to announce that we’ve taken the difficult decision to cancel this year’s Grad Ball. We reached this decision because ticket sales have not met the level that we need to be sure of a high-quality, enjoyable and financially viable event. Everyone who has bought a ticket will be given a full refund. Grad Ball was traditionally held on campus but has taken place at Blackpool Tower for the last few years. Ticket sales have been falling annually for the last three years and last year we made a loss on the event. We decided to bring the event back to campus this year in the hope that taking away the inconvenience and additional expense of travelling to Blackpool would make attending Grad Ball a more attractive proposition. Disappointing ticket sales for this year’s event have revealed we got that wrong, which is why we’ve reluctantly decided to cancel. The union will lose money by cancelling the event at this point, but not as much as we would lose if it were to go ahead. We’re exploring whether we can find alternative ways of staging the acts that were due to perform – further announcements will be made on this soon. It’s become clear that the union is unable to provide the kind of Grad Ball that you want with the resources available to us, so we are suspending this event for the foreseeable future.